Friday night had a little of everything sprinkled in it for the New York Ranger and New York Islander prospects. From a battle of conference leaders in the WHL to the almost flat out war between border rivals Minnesota and Wisconsin, it was easy to find entertaining hockey to watch. I am beginning to feel bad for Adam Tambellini (NYR 2013 3rd) as the one question he keeps getting asked over and over (and yes I asked him the same question too) is "What was the biggest reason why you left North Dakota?" Tambellini since day one has steadfastly said that the decision to leave North Dakota and join the Calgary Hitmen of the WHL was all about hockey and furthering his development. Truth be told after 14 games with the Hitmen, Tambellini's game has backed up everything he said about why he left North Dakota. Tambellini is playing more games and more importantly his game is showing what the increase in playing time has helped his game. 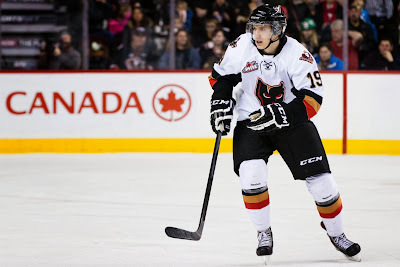 Against the Vancouver Giants, Tambellini (the game's #2 star) had 2 goals as part of the Hitmen's 5-0 win over the Giants. Tambellini scored the Hitmen's 3rd and 4th goals of the game with both of them coming on the power play giving him 3 power play goals in his last 2 games. Tambellini's first goal was a sweet shot in which he took advantage of a screen being set and then found a way to get the puck in on the short side that the Vancouver goalie never saw. The 2nd goal was simply Tambellini skating his way into a open spot of the ice, setting himself up for a pass and then one-timing the puck into the net. Tambellini did all the right things you want to see come from a power play by using the cycle to create his offense. The goals were Tambellini's 6th and 7th of the season as he improves to 7-10-17 in 14 games. Calgary needed the win to keep pace with the Edmonton Oil Kings and they got that win. The game of the night for me was getting to watch top ranked Minnesota trying to earn a series split against border rival 12th ranked Wisconsin in Big Ten action. These two schools have been hockey rivals (and in other sports as well) since before I was born over 50 years and this was a typical matchup. Both teams came out looking to hit anyone and anything that was moving as the hitting was hard, heavy and on a couple of occasions across the line. The further this game went the more it seemed like there was a mini scrum after each whistle stoppage. Wisconsin got the better of Minnesota for the 2nd straight night winning this game 2-1 and giving the Badgers their first sweep of a team ranked number 1 in the polls for the first time since 2004. Minnesota's trio of prospects, Brady Skeji (NYR 2012 1st), Taylor Cammarata (NYI 2013 3rd) and Jake Bischoff (NYI 2012 7th) were all held scoreless and honestly were all non-factors in this game thanks to the Wisconsin physical game. In a way I was disappointed in Skjei who as one of the biggest players on the ice for either team was not able to use that size to his advantage. The smaller Islander duo I could see having trouble with a physical game but sorry Skjei needs to step up more in games like this. For most players this season, a 1-1-2 performance would be worthy of a star but when you are Anthony Duclair (NYR 2013 3rd); all that is just an average game for him. Duclair with his 47th goal of the season and his 42nd assist helped his Quebec Remparts to a 3-0 win over the Drummondville Voltigeurs. The win clinched a playoff spot for the Remparts as Duclair extended his scoring streak to 9 games (11-13-24) as Duclair has pulled to within 1 point of the leading scorer of the QMJHL. Duclair still has 15 regular season games left and is on a pace to finish with a 61-54-115 point season. Mackenzie Skapski (NYR 2013 6th) continued his winning streak as he stopped 23 out of 24 shots to help lead his Kootenay Ice to their 4th straight win 8-1 over the Lethbridge Hurricanes. For Skapski the win was his 8th straight and for the 4th time during this streak, Skapski only gave up 1 goal. Granted the Hurricanes have the worst record in the WHL and weren't a serious threat but a win is a win. Skapski with his win moved to 19-13-2-1 with a 2.75 goals against and a 0.916 save percentage as well as moving into the WHL's top 10 among goalies checking in at number 9. Griffin Reinhart (NYI 2012 1st) had a secondary assist on his Edmonton Oil King's 2nd goal of the game as the Oil Kings won their 10th straight game with a 3-2 shootout win over the Kelowna Rockets. It was the battle of the WHL's conference leaders and this one did not disappoint with both teams putting on solid defensive efforts. Reinhart and his blueline mates held the Rockets to just 1 for 6 on the power play. For Reinhart, the assist was his 13th and 16th overall point. Ryan Pulock (NYI 2013 1st) had a primary assist on his Brandon Wheat Kings first goal of the game and added a +3 to help the Wheat Kings spank the Swift Current Broncos 8-1. The primary assist on the only goal his team really needed was Pulock's 30th as he improves to 16-30-46 on the season. More importantly for the Wheat Kings was defeating the team chasing them for the WHL's East Division lead as it gives them a 2 point lead over the Broncos who also hold a game in hand. Cristoval Nieves (NYR 2013 2nd) may be suffering from the sophomore slump (1-9-10 in 22 games) but his 10th ranked Michigan Wolverines are winning as they took on Penn State for the first time in school history. Michigan got multiple points from 7 different players and Coach Red Berenson moved into 4th place on the all-time Division One hockey coaches list with his 770th win. Nieves has been a major disappointment this season after going 8-21-29 was scoreless with just 1 shot. The win though pulls Michigan to within 6 points of Big Ten leader Minnesota with Michigan having 3 games in hand. For Penn State goalie Eamon McAdam (NYI 2013 3rd)got the start but was pulled after giving up 3 goals on 11 shots. Loic Leduc (NYI 2012 4th) was scoreless as his Rimouski Oceanic defeated the Saint John Sea Dogs 4-2. Leduc was a +1 on 1 shot as the Oceanic moved into 7th place in the QMJHL. Victor Crus Rydberg (NYI 2013 5th) was scoreless as his Plymouth Whalers earned a 5-1 win over the Sault Ste. Marie Greyhounds. Crus Rydberg was quiet other than a slashing minor he took in the 2nd period. Jesse Graham (NYI 2012 6th) had a primary assist as his Saginaw Spirit lost to Graham's former team the Niagara IceDogs 4-2. The assist was Graham's 31st and his 41st point which matches his career high set 2 seasons ago. Steven Fogarty (NYR 2011 3rd) was scoreless as his Notre Dame Fighting Irish were edged 2-1 by the Maine Black Bears in Hockey East action. Fogarty like Nieves has been a bit of a disappointment in his sophomore season but unlike Nieves, Fogarty's team has dropped 3 straight games and is in serious danger of not making the NCAA tournament. Doyle Somerby (NYI 2012 5th) was scoreless on 1 shot as his Boston University Terriers played to a 2-2 overtime tie with UMass-Lowell. Stephon Williams (NYI 2013 4th) was "DNP" by his Minnesota State team.